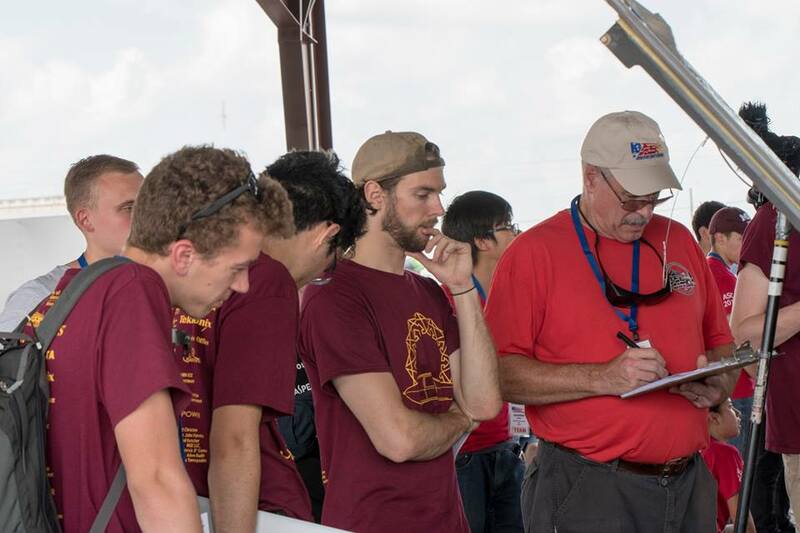 The University of Minnesota Solar Vehicle Project set off on a journey during the Summer of 2018 to race against solar car teams from around the world in the American Solar Challenge. This journey has pushed us to do great things and has given us unforgettable life lessons. Here is our story. On Wednesday, July 4th we drove down towards Nebraska for the start of scrutineering (the process where professional industry engineers inspect the solar car’s electrical and mechanical systems for driver safety and overall roadworthiness). The first night we were planning on putting some finishing touches on Eos II so we could test drive the first leg of the ASC route the next day, but there was a huge thunderstorm that prevented us from getting any work on the car done. We packed the car away in the trailer and hunkered down in our tents. The following morning we packed up our drenched tents and drove to a campground just 30 minutes from the FSGP racetrack. The weather on Thursday was beautiful and we were able to dry out tents and work on the car. Several people put in the first of many late nights getting the car ready for scrutineering. Unfortunately, we were unable to test drive the first leg of the route. On Friday, July 6th, day one of sscrutineering, the team checked in at the track in Hastings, NE. During the first day, we passed Electrical, Battery Protection, Driver Registration, and Driver Operations (emergency occupant egress), with green signifying a full pass of that station. We also received a yellow, meaning a pass requiring further justification in mechanical because the inspectors were skeptical about the strength of the joint holding our seatbelt mounts in place. To prove this, we had to do some simple calculations. They also required us to add safety wire to the wheel lug bolts. This required that we drill holes in all the lug bolts and secure the lugs with twisted wire ensuring they can not come loose. On the second and third day of scrutineering we had just a couple of stations left in static scrutineering in order to qualify to get out on the track and perform dynamic scrutineering. We were able to make the previous fixes and received our final greens. Our goal was to be the first team done with all of scrutineering and to rest the final day in preparation for the start of the track race, the Formula Sun Grand Prix (FSGP). We were very close to completing all of the stations, but had some trouble with the slalom test that pushed our scrutineering completion to the final day. It turns out that while we were doing battery protection scrutineering with Eos II, a single set of shunt resistor wires were not reinstalled correctly and causing battery to have faulty current readings. On the last day of scrutineering, we fixed our battery problem and quickly finished the slalom and brake test with ease on the last day. Because of the battery fix, we needed to re-scrutineer our battery protection system. Once that was done, we received greens in all stations of scrutineering showing we were officially completed with scrutineering! With that, we had earned pole position Number 3 out of 20 teams for FSGP! That is the first of the Multi-Occupant vehicles to finish scrutineering and first vehicle from America. The two teams ahead of us were two Canadian teams: ETS and Esteban. Additionally, while a majority of our main members were in Hastings, there were still events happening in Minnesota. While FSGP was happening, our members back home brought one of our old solar cars, Centaurus III, to the grand opening of a museum just a few blocks away from our shop. This was a very cool event and we were all happy that the team was able to attend. For the start of FSGP we were with only one other MOV on the track, Onda Solare, an Italian 4-seat solar car. The first day of racing was very intense as we tried to qualify all of our 3 drivers. We ran into trouble when Eos II’s speedometer stopped working. We ended up driving the rest of the day without it. Each driver did a great job keeping a consistent speed by only knowing their final lap times. By the end of the day, all drivers were qualified and they collectively drove more than 96 laps in a single day, qualifying us for ASC! We fixed the speedometer issues later that night in the pits and were ready for the next two days of ASC. With a grand total of 326 laps, all carrying a driver and a passenger, we placed first in the multi-occupant vehicle class! That lap count competed with the faster single-occupant class as well. We would have received 4th place overall with the single occupant solar cars! In our class, Onda Solare from Italy placed second, and Appalachian State’s, Team Sunergy placed third. On July 12th, the team made their way to Omaha for practicality judging at the Lewis and Clark Landing. 20% of our total score is based off of the car’s consumer friendliness and practicality, so this day was dedicated to the scoring of our cars. We spent the short time between FSGP and the judging making our interior look as good as possible and preparing our practicality presentation. On the 13th, we were one of the first cars to the landing. We set up our UMN canopy and finished cleaning the car. As many of the other teams started unloading, it began to rain. The next couple of hours consisted of teams trying their best to cover their cars from the weather, while other teams simply refused to take their car out of their trailer. The parking lot ended up being crammed with trailers. Almost all hope was lost for doing the ASC team picture until the rain finally stopped. The rest of the teams were able to quickly take their vehicles out of their trailers and scoot together to take a photo with all the cars and their race crew members. After that fiasco, we were the first MOV to present our practicality presentation...and we nailed it! We were the one of the only teams that had a large practicality poster that showed all the cool features of Eos II like its center interactive display, interior design, trunk space, and seat comfort. The judges were also very impressed with our key fob that could honk Eos II’s horn. Eos II’s parallel parking was very comical at first because the cones were so low to the ground Eos II was able to drive right over them without knocking them over. But once bigger cones were brought out, the parking was easy. There was also a test for starting the car while going up a hill. Eos II was only able to make it half way up the test hill. This did not go as well as planned given our motor specs, but this would be understood by our race crew members later on in the race. We drove all of Stage 1 with ease. There was one point where we had to do a traffic dump because there were regular cars stacked behind us that we had to let pass. We drove Eos II on the shoulder, rolled over a sharp object, and blew a tire. We had to stop for 10 minutes to do a tire change. We kept driving and arrived at the stage stop just minutes after another MOV team, Onda Solare. However, our small battery gave us an edge on our efficiency score for the stage, and we received an award for the Multi-Occupant winner of the first stage! We ended the stage at Scotts Bluff National Monument where we had our evening solar charge surrounded by the beautiful bluffs. Some members even climbed them! Everything ran very smoothly and we were very happy for the great start. Unfortunately it was more cloudy than we were expecting it to be and Eos II’s battery state of charge was not as high as we hoped it would be. For Stage 2, we headed out for a very interesting turn of events. At the beginning of the day we decided to run on a single motor because one of our motors was giving us trouble. We were rolling up to the checkpoint in Casper, WY that was on top of a hill. Due to having a single motor running, Eos II did not have enough torque to get up the hill, so our team members had to jump out of the chase car and push it the rest of the way up. This resulted in a 32 minute penalty. It was a shock to many people, but our overall score was still ahead of Onda Solare. While at the 45 minute checkpoint, it started hailing out of nowhere. This would be very tragic for solar cars that were out on the road, but since we were at the checkpoint, we were able to very quickly move Eos II into its trailer before any hail could damage its solar array. But of course the day was not done - there was still an hour or so left in the race day. We decided not to take the risk of driving anymore during that day in case it started hailing again. Onda Solare did the same. We drove Eos II to a parking lot to normalize, but hopes for sun were very low because it was still very cloudy. We pushed Eos II up another hill to a better spot as the clouds started to clear. Just as we flipped up the arrays, the sun finally came out in a glorious sunshine. Everyone was ecstatic as our array was bringing in more power than usual. This is because the wet parking lot in front of Eos II reflected light at our array. It was almost like having two suns pointed at our array. We ended the day with a healthy amount of charge in the car and a determined attitude to win. We arrived at the Lander, WY the next day. For stage 3, we spent the night preparing Eos II for the 30+ mile mountain climb up the South Pass in Wyoming. Our scout car told us that there were three sets of hills on pass, each progressively longer and steeper than the last, followed by a large section for downhill over the mountain pass. We had a big team meeting the night before explaining to everyone the seriousness of getting over the South Pass. From what we had observed over the past week, we had come to the conclusion that one of our motors had become demagnetized and had been causing torque and efficiency problems. So with this, we decided to switch out the faulty motor with a back-up motor. We were still concerned about the motors overheating, so we also decided to drive up the mountain with the rear wheel fairings removed. This increased airflow to the motors in an effort to help cool under the high loads from the steep, long climbs. This gave Eos II a strange look and affected its aerodynamics, but keeping the motors cool was more important. Our strategy also had a plan B just in case we did not make it up. We rented a flat bed trailer from U-Haul so that if we had to trailer Eos II up the hill, then we could solar charge while the car was on the trailer. When the time came for the mountain climb up the South Pass and Eos II ran smoothly right to the top. After the crest of the mountain pass we pulled over and reinstalled the wheel fairings. Everyone was very pleased and we drove to checkpoint while the truck thankfully returned the flat bed trailer back at the start of the stage. The worst part of the race, we thought, was over. We drove into Farson, WY, had some ice cream, put two people back into the car, and finished the drive to Arco, ID. We were the first multi-occupant team to arrive at the Arco stage stop, coming in just four minutes before App State. As of Stage 2, the stage winner in our class was determined the same way as the single-occupant class, by the least elapsed time. Therefore, we are happy to have won stage 3 in the multi-occupant class! Fun Fact: We found out after this climb that all of the solar car teams at the Arco stage stop bought out all of the bottled distilled water in the whole town of Arco, ID to spray their arrays while normalizing. Spraying the array with water helps cool the solar cells. Solar cells don't operate as efficiently when they are hot so it is critical to keep them cool so they gather as much energy as possible from the sun. For Stage 4, the team left from Craters of the Moon National Monument headed towards to the Mountain Home, ID checkpoint. This is where our story takes its sad turn. About 20 minutes into our drive, the solar car driver observed smoke coming from the dashboard. The caravan immediately pulled over and performed an emergency battery fire safety maneuver, where the driver and passenger egressed from the car very quickly getting a safe distance from the car and team members ran over with buckets of sand to pour over the battery. The maneuver itself was done perfectly and thankfully the smoke was not from the battery and sand was never poured. We found out that the smoke was caused by a circuit board shorting to the carbon fiber in the dashboard. We quickly inspected the components, replaced a blown fuse and the car worked again. So we started driving again. After another 10 minutes of driving, the support vehicles lost connection to Eos II’s telemetry network. We radioed the solar car passenger to check the connections on the telemetry antenna. When he was checking the connections something sparked and he was given a minor electrical shock. We pulled over immediately again and then found the bigger issue than we originally thought happening. Somewhere the high voltage DC current was shorted to the carbon fiber chassis of the car. We spent a grueling 7 hours in the gravel parking lot of a seed storage facility troubleshooting the issue and trying to find where the short was. We were systematically checking different electric systems in the car to find what the source of the short was. In this process we diagnosed that the short had also caused other systems to fail. After fixing damaged electrical systems, soldering spare components on the side of the road, and electrically isolating the suspect cause of the short the car was working again. We got back on the road to try to make up as much time as we could for the last hour of the day, but again had to pull over after only 10 minutes into the drive because of a smokey smell in the car. Obviously the short was still happening. We packed up for the night, not even close to the Mt. Home checkpoint, to troubleshoot the issue even more. Late in the night the electrical team found the root cause of the electrical short. It was caused by the back-up motor. The windings in the spare motor had shorted to its aluminum housing and therefore had shorted to all of the metal and carbon fiber components attached to it. The only way to safely fix this was to put the demagnetized motor back in. Unfortunately because we lost so much time the day before we would not be able to finishing the stage on time so we had to trailer to the end of the stag. In addition to this deadline we needed to get to the finish line in Bend, OR in a total elapsed time of 62 hours or less or our efficiency score would be zero. At this point, even if we got back on the road as quickly as possible we wound't finish in 62 hours. Trailing would not have made a difference to our overall score. So we decided to finish charging that morning and trailer to the stage end in Burns, OR where we would make the last sprint to the finish line to win the last stage. This turn of events took a toll on our team members and their competitive spirits, but it brought many of us closer and we were all very supportive of each other. It is times like these that make us stronger and more willful to do better with the next solar car and the next ASC. For Stage 5, the team sprinted from Burns, OR to the High Desert Museum in Bend, OR and did so with ease. It was very exciting to be the first MOV to cross the finish line. We were very happy to finish under our own power, even with an efficiency score of zero. Waterloo and App State also did not make it to the finish line in the 62 hour time limit. It all depended on our practicality score at that point for whichever team would get 2nd place. The total practicality scores were given at the very end. We tied with App State in practicality. The awards ceremony was right after. We received the awards for 1st place at FSGP and 2nd for ASC tied with App State. The ASC observers were also kind enough to gift us a new lucky lawn gnome because they saw DCT was getting a little roughed up. We were very pleased to receive this wonderful gift and we hope it will bring more sunshine and happiness like DCT currently does. Thank you for listening to our story and thank you to our sponsors who have supported us throughout these past two years. If you would like to help us succeed in our journey to the next World Solar Challenge in 2019, please visit our crowdfunding campaign at crowdfund.umn.edu/UMNSVP.